Yes, seriously! 18 bands, two stages, a fiver in and loads of drink promos! That’s the name of the game at Fibber MaGee’s on April 13th as metal comes to town. For anyone that thought the Dublin Day of Decay was the next big day out, welcome to hell!. There’s quite a few names so I’ve posted the names and stage times for each act below. Went through all the effort of copy and then paste to get that info to you so please take the time to read it. Of course I didn’t forget the amazing drink promos either. April 13th @ Fibbers. See you there! For more information, check out the Facebook Event Page. 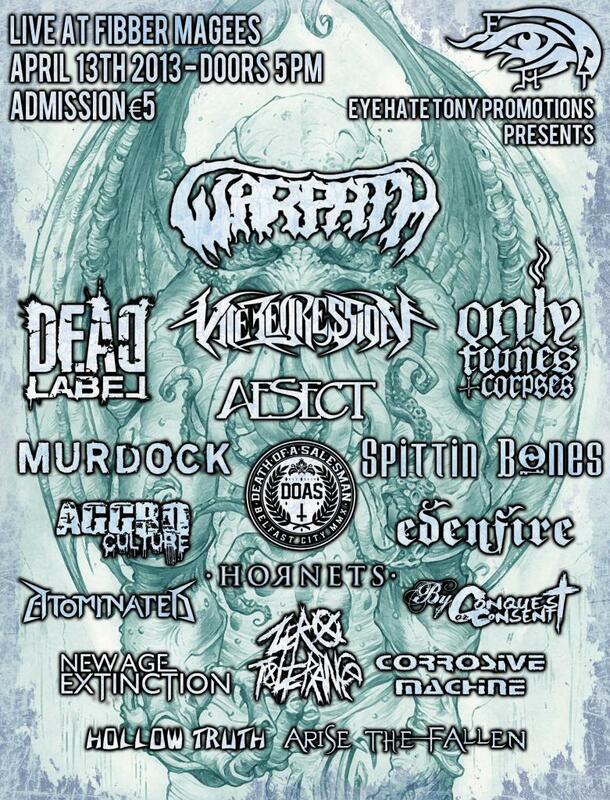 This entry was posted on March 27, 2013 at 5:20 pm and is filed under Gig Listing, Music with tags Aesect, Dead Label, death metal, Dublin, Dublin gigs, Fibber Magees, heavy metal gigs, METAL!! !, Only Fumes and Corpses, Thrash Metal, Vile Regression, Warpath. You can follow any responses to this entry through the RSS 2.0 feed. You can leave a response, or trackback from your own site.